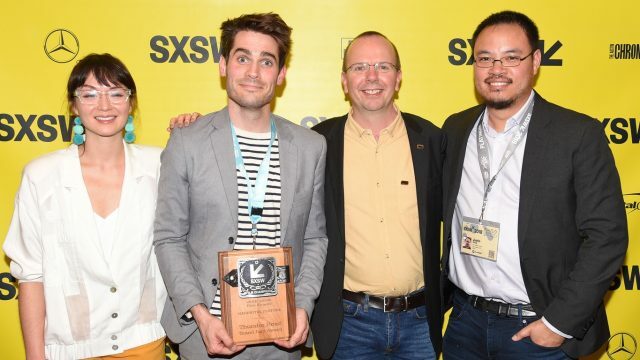 Filmmaker Jim Cummings is no stranger to the SXSW Film Festival. He’s produced many films that have word premiered at the festival and last year he was included in our SXSW Film 25 Alumni Series. In 2016, Cummings received a Special Jury Recognition for Acting in the short Thunder Road, a film which he also directed, wrote, and edited. In 2017, he brought the short Robbery and then returned to SXSW in 2018 to unveil the feature version of Thunder Road where it won the Narrative Feature Grand Jury Prize! Thunder Road opens in theaters on October 12 and will be available digitally on October 26. Before you watch it, read our interview with Cummings where he discusses his passion for SXSW and why Thunder Road was a story the world needed to see. Jim Cummings: Thunder Road is a love letter and apology note to my mom and to all of the other parents who had to put up with a difficult child. It’s a document of my love for people, of life-affirming art, and also I hope that it’s proof of life for DIY filmmaking. JC: I really wanted to wake people up like Springsteen did. I wanted to encourage people to stop being spectators of their lives, to change if they’re unhappy. JC: Oh man. I don’t know. I would love for people to be more considerate of their lives and their legacies here on this planet. JC: I was editing the film. I was in my office mixing the parking lot monologue and I got the email and ran around the office shouting and giving high-fives. JC: It is the perfect audience. I have screened the film around the world since, but the SXSW crowd appreciated the comedy and the drama, they don’t take themselves too seriously, they love big comedy, but appreciate humanity on film, too. We got big laughs in the theater and big hugs in the lobby. JC: Seeing Krisha. I sprinted in a suit (this was when I was still a producer) to the Alamo Ritz at 11am, made it just in time, laughed throughout, and then spent 2 hours crying and walking around the river. Describe what you were feeling during your SXSW premiere? JC: Anxiety. Nobody had seen it in a crowd before. I didn’t know if any of the jokes would land, I was nervous. There’s a photograph that a friend took of me right outside the theater and I look white as a sheet. But then everybody loved it and I was able to sit back with my girlfriend and enjoy the movie with the crowd. It was great. What was going through your head when Thunder Road took home the Narrative Feature Jury Award?